In keeping with the regeneration and upswing of Manchester city centre, yet another major London musical show has dropped anchor for a while at the Palace Theatre. Treating the local, and not so local, community to a short run at one of Manchester's finest is the West End smash, Wicked. 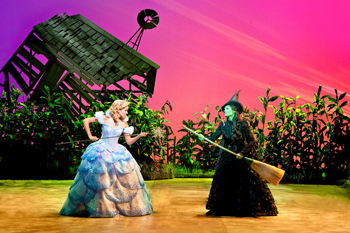 Billing itself as "The Untold Story of the Witches of Oz", the story centres on Elphaba (The Wicked Witch of the West) and Glinda (The Good Fairy). The play picks up where the film left off with the Wicked Witch of the West being dead and us holding the worst opinion of her - evil, vindictive and malicious. The first half deals with setting the scene of Elphaba's shameful birth, her father's disappointment with her, teenage years full of rejection, and the early, shaky friendship of Elphaba and her first meetings with Glinda or Galinda (depends where you are in the story). When Elphaba is dead, the inhabitants of Munchkinland celebrate, and Glinda holds forth to the inhabitants, promising to guide them to a better future, as their greatest fear is no more. Entertaining though it may be with attention-grabbing dance routines and clever dialogue, I found it rather "twee". However, this is redeemed when the first half closes to a resplendent rendition of the anthemic song "Defying Gravity". To make the most of the second half you have to have paid attention in the first half. Elphaba's and Glinda's shaky friendship demonstrates just how false and devious life in the Emerald City can be. The extremely creative costumes are very off the wall, and more so than the film. The singing was pitch perfect from the two main characters, especially Elphaba who not only has a glass shattering singing voice, but a real feel for the role. It plays out pure warm-heartedness and the relationships she forms with both Glinda and Fiyero - very convincing. It's hard to transmit the chemistry between characters, but it succeeds, with the moment when the two leads share the song "For Good" being extremely heartfelt. I defy you not to wipe away a tear. Having understood Elphaba's experiences and why she is the character she is, in Act II we see more of her character unfold - and you will be surprised. It's very clear she is totally misunderstood, self deprecating and extremely warm-hearted. Nothing like the malevolent character portrayed in the film. It was here that I really got drawn in. Elphaba is more than ably-played by Nikki Davis-Jones, who manages to transmit to the audience the "underdog" mentality of the character, and her portrayal was key in making me feel deeply sorry for her. Quite surprising as sorrow is not normally an emotion I feel for a witch! But credit too must be given to Emily Tierney who plays Glinda, the arche-typal blond bimbo, and cleverly portrayed. Operating to the expected blonde bimbo typecast, Tierney manages to conveys a warm-heartedness to match that of Davis-Jones. The two leads are exceptional together. Pure friendship and mutual affection for each other fills the auditorium. 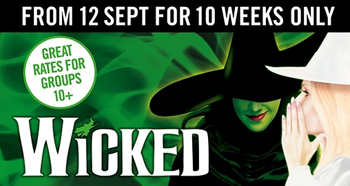 Wicked is of course known for it's show stopping tunes and mesmerising dance routines, and this production is no different. With a smaller cast than I was expecting, the company takes you on a colourful and fantastic (in the original sense of the word) journey into Oz and makes it very real. However, it was the writing that took more of my attention. Although not overtly obvious, the storyline includes some hard-hitting truths that are very relevant today. Truths such as putting your trust in the wrong person and being betrayed; how publicity and fame can be easily manipulated for good or bad, and, in the case of Elphaba, not judging a book by its cover. These themes are not totally obvious but cleverly woven in for you to discover yourself. There is no doubt that this production will exceed all your expectations of the show. From the glass-shattering singing voices of the lead characters to the inspirational costumes and choreography, you will be entranced. Believe it or not, it is a heart-warming and clever story. And, for me, it ticked my one big box of success - I was still thinking about the show the following morning - always my acid test!